Opinari - Latin term for Opinion. Opinari.net is just what it seems: a cornucopia of rants, raves and poignant soliloquy. "Now, drug-gang violence, until recently confined to Ciudad Juárez and other cities far to the west, is startlingly close by. Last month, some 30 gunmen stormed two hotels in Monterrey and kidnapped six people, in a shock for the city. The 130-mile highway from Monterrey to the border has seen a number of incidents, including a recent shoot-out between armed men and the Mexican military." The hotel that was stormed is frequented by our staff when we are sent to Monterey. Monterey is where most of the work from here is being sent. Furthermore, that work cannot go there without our technical resources travelling there to educate the staff and mangement. If Monterey and Mexico cannot guarantee the safety of our people there, and if the drug violence continues to escalate, I would hope the decision makers would see fit to rethink these changes. Otherwise, the price that will be paid could be greater than a few hundred lost jobs. If you've ever used iTunes, and an iPhone, undoubtedly, you've installed apps or downloaded music on your device without syncing it to your computer. Also, you've probably moved to a new computer along the way. That's what I've been doing all week, trying to get my data moved to a new MacBook Pro, and getting it synced with my iPhone. The process is trivial, but with one rather large caveat if you're not paying attention. When you check the box in iTunes to sync your apps, a dialog box opens that asks you if you want to overwrite the apps on your iPhone. Obviously, you don't want to do that, but I know lots of users who, in an attempt to sync their device, click Yes, only to find that their apps are long gone from their iPhone. Not a good feeling. So what's the fix? It's rather simple, and requires you to know to look for it, I think. Right click in iTunes on your iPhone, and select Transfer Purchases. This selection is prominent in iTunes documentation, but to many users, it's very much non-intuitive, as it isn't part of the syncing process. So if you're moving to a new machine, when you tether your iPhone or iPod Touch to your computer, trust me when I suggest that you follow this procedure (as well as backing up your device to iTunes) before doing anything else. In the last week or so, I've been acquainting myself with a brand new MacBook Pro. I decided that I needed one machine to run all of the various OSes that I use, so this was my choice. So far, I'm impressed. But there are, as expected, some quirks that I have to overcome along the way. On OS X, I've grown to like the Spaces feature, which effectively segregates my workflow in four distinctly hidden screens. However, I am a keyboard junkie, and I prefer to access it using the F8 key. This is well and good, until I realized that iTunes was popping up every time I tried to access Spaces. Well, it turns out that F8 has dual uses on the MBP. In this case, it also... yes, activates iTunes. 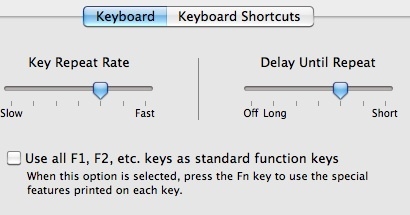 Using the 'fn' key on the lower left corner of the keyboard activates the function key. Yes, I know, this is commonplace on today's consolidated keyboards, but for whatever reason, it didn't occur to me until I perused the Apple website. 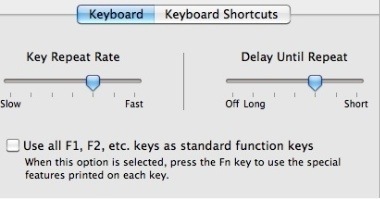 Alternatively, if you don't want to use the special functions, go to System Preferences | Keyboard and check the box in the picture below. I prefer to have my full keyboard functionality, but this was very frustrating. Fortunately, if you're reading this, and you use a MBP, you won't share my frustration. Is this blog still here? Apparently so. There's so little time in the day, and I've been working on other projects, such as learning Objective-C, the iPhone APIs, XCode, and blogging at my other site, http://www.theiphoneand.us. Maybe I'll get back to this blog soon, too... assuming I can find more time in the day. Heh. Any power user of email on the iPhone knows that one feature sorely lacking is true push email notification , at least where Gmail is being used as the mail provider. GPush is an app that looks to bridge that gap. The UI is simple. Basically the end user enters his or her Gmail login ID and password, and awaits a confirmation from the GPush servers that the configuration is accepted. GPush encrypts login credentials for those who may be concerned with secure transmission of user ID and password. GPush does exactly what it claims to do. When an email reaches the GMail account, a push notification is sent to the user's iPhone. This is a feature we in the enterprise space have come to expect from email clients on mobile phones since the advent of Blackberry and ActiveSync technologies. Why Apple didn't integrate IMAP push is anyone's guess, although I suspect battery life was a concern. However, the GPush app should if anything improve battery life by allowing users to disable email polling on the iPhone client side. Whether or not this is the case remains to be seen, as I have just implemented GPush on my own device today. I like what I see so far, but I do have some requested enhancements. First of all, I'd like to be able to configure GPush for multiple accounts. It does not appear to allow me to do that. Secondly, I'd like to have a button on the push notification that automatically opens the mail client instead of simply showing me an OK button which really does nothing but close the dialog box. As it is now, I have to close the box, open GMail and refresh the client. And lastly, I'd like a way to clear the badges off of the GPush icon other than turning them off entirely. All in all, GPush is a great app for GMail users. I think $0.99 is a stellar price. I'd like to see Apple eventually build this into the mail client, but until they do, I expect GPush will stay prominently on my iPhone. UPDATE: it seems that I am having to reauthenticate into the GPush servers every 30 minutes or so. Tweets from the GPush team indicate that they're working on some issues, so I will assume they know about this one. Hopefully they've rectified it soon. It's funny how one program's screw up can have unintended consequences, leading to a chain of frustrating events. That happened to me recently as I encountered an issue with Firefox 3.0.10 on my Hackint0sh netbook. It appears that Firefox 3.0.10 has something of a Flash stability issue. The only way I was able to fix it was to disable Flash. which didn't work when I actually wanted to view Flash content. So, I resolved to try something I had not done before - restore from Time Machine, Apple's robust built-in backup solution. 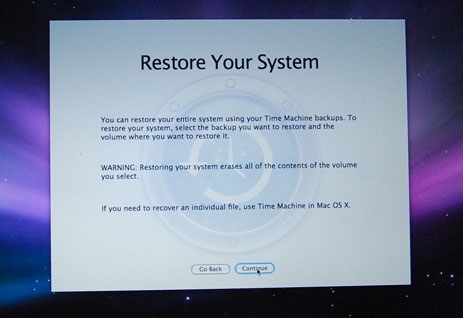 My first attempt was to simply call up Time Machine, find the last backup before the Firefox issue, and roll back to that point. Sounds easy, right? Well, it turned out that I had permissions issues in restoring my Library folder. Library contains all of your user settings for every program you have installed. 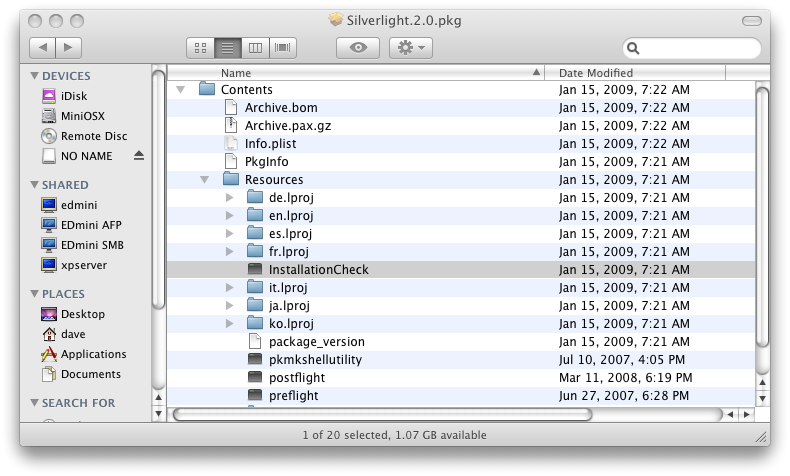 Without that folder's contents, you essentially have to reconfigure and re-register every program you have installed. I proceeded to repair the Mac OS permissions database, which ostensibly should have given me rights to restore my previous Library folder to the OS. However, this didn't work as I had intended. It restored only a subset of settings. I was flummoxed. So, I decided to try a full restore using the Leopard install disk. Using the USB keys I had created for the original Hackint0sh install, I booted to the install disk and selected the option to restore from Time Machine. For whatever reason, the Mac wasn't able to find the boot partition. I hadn't counted on this issue coming up. I was able to use the USB bootloader to direct me to the right partition, but not without it. After days of frustration, I came across a suggestion in a forum online that I reload the DellEFI bootloader from the GUI. I did so, rebooted, and that fixed the problem. So, it turns out that Time Machine does play well with the DellEFI for the Mini 9 Hackint0sh. It just required a little research, and some patience. And now, I have a pretty straighforward way of restoring from Time Machine backups in case my Mini has a HD failure, or if I decide to upgrade. If you are in need of some new software for your Mac, or if you're a bargain hunter like me, you'll be interested in the Macweed Creative Bundle, available at macweed.net until August 10 for only $49.99. OMG, my battery is almost dead! With my old Treo 680, all I needed was an aftermarket battery that doubled the device's capacity and all was well in the world. But Apple, being the proprietary junkies they are, have stuck the end user with a non-replacable battery. Of course, there are always enterprising individuals out there who are willing to provide an alternative solution, so if you look hard enough, you can find an aftermarket battery replacement, but until I've had my iPhone a bit longer, I'm not willing to do something that will void the warranty. So, enter the external battery solution. To that end, I chose the Incase Power Slider (retail $89, on sale at Target for $62). At first I was very pleased with the Power Slider. It added a lot of bulk to the iPhone which will turn off some users, but that's fine with me as I use mine in a manufacturing environment. The case fits snugly and definitely offers a high degree of protection for the device. The external battery has to be charged for several hours before initial use. This isn't such a big deal unless you're absolutely dying for some juice to your iPhone on the spot. Once charged, just slide the phone into place, and you're good to go. Now, as I said, I was pleased "at first". What turned me off of the Power Slider? 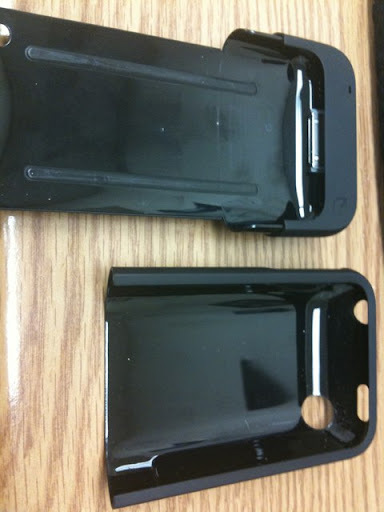 For whatever reason, the case severely inhibits the signal strength of the iPhone by about 3 bars on average. In fact, in the factory and offices in which I work, I have zero coverage in about 3/4 of the area. For someone who relies on push notifications and network connectivity no matter where I am, this is unacceptable. I don't quite see in the case's design where and why it is causing such a reduction in reception. As far as I can tell, the antenna is only covered by the plastic case. To Incase's credit, they have offered a full refund based on a one year warranty on the case. I don't want to return it, as it offers solid protection, but I don't have a lot of choices here. So, my question is this: what battery/power solutions do others use for their iPhone? Does anyone recommend an alternative case/battery combo that does not inhibit the mobile signal? 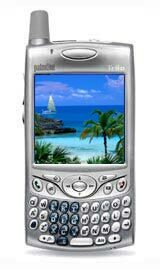 Truth be known, there are some things I miss about the Treo series of smartphones. One of the most obvious things is ZLauncher, a customizable app launcher. The default offering for the iPhone is just too limited. What a power user needs is a tabbed launcher that contains only the apps for that particular tab. For example, I would like to have a tab for Utilities, another for Games, another for Productivity apps and so on. What the iPhone offers me is space for 176 apps plus 4 in the Dock, with no way of titling the individual panes that contain the apps. This just isn't very efficient. What I and many other users would like to see is a dropdown or tab where i could assign apps to those panes. Given this functionality, I would be better able to find the app I need and the desktop would be more aesthetically pleasing and better organized. For now, I find that I am forced to manually drag apps to different panes to organize them, and even then there is no way to title those panes, and I am limited to the screen real estate of 16 apps per pane. Why doesn't Apple offer this out of the box? I have no idea. Why hasn't another developer provided such a solution? Likely because of Apple's imposed limitations on background processes that can or cannot run on the device. Regardless, I'm hopeful that Apple finds a way to incorporate a more robust launcher into the next version of the iPhone software, or at least I'm hopeful that a third party can find a solution that will please Apple and iPhone users alike. Yes, I'm new to the iPhone. Yes, I'm pretty pleased with it so far. And yes, I often find some things that are a bit perplexing. This morning I was looking at the iPhone Settings and i inadvertently clicked an unknown slider. Later, I noticed a mysterious phone icon in my system tray. Anyone know what this is and how to turn it back off? Now I've been a long time patron of Target, even to the point of once holding two charge accounts there simultaneously. Currently, I have only one, which has not been used in many months. As such, I could not locate my card, and I was wanting to make a reasonably sized purchase. However, I was told that I needed to report the card lost, and wait 7-10 days for its arrival. When I asked why I couldn't just use the existing account, they said there was too much potential for fraud. "How do we know it isn't stolen? How can we verify the identity? ", they asked. When I produced the account number along with 2 photo IDs, they were unfazed. So, just so we're all straight here... Target and their financial subsidiary have the belief that a customer who can recite their account number, and produce two photo IDs is quite possibly a fraudulent patron, while a person who has nothing more than a Target card in hand, with no semblance of an ID, cannot possibly be a thief. Sigh. It is no wonder so much waste exists in the credit card industry. 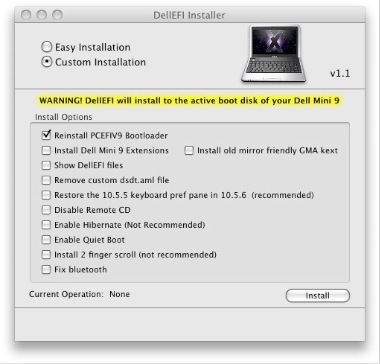 If you're like me, you do a lot of your personal computing on a Dell Mini tricked out as a Mac. While this setup is terrific for the most part, there are sometimes some challenges. One such issue is with streaming Netflix movies. It seems that Netflix hearts Silverlight, and Silverlight does not heart Power PCs. Or, more correctly, Silverlight only hearts particular Intel devices. 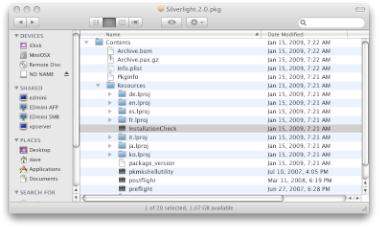 Whenlight plugin the Silverlight plugin is installed, if you're running a Dell Mini, you see the error to the left. Installation check? How quaint. I removed that file, and voila... we have Netflix on the Dell Mini running Mac OS X. Today was a pretty rotten day as days go. The morning at work presented some issues caused by typical ineptitude. When I arrived at my office, I discovered that I had forgotten my breakfast. An email from our credit union loan officer disclosed to me that mortgage rates are .6 % higher than when I started my refi application only days prior. A billing snafu led to us having our water turned off until tomorrow... sometime. My Speedpass wouldn't work at the local Exxon. And my dog barfed on the carpet for the second time in 24 hours. Indeed, days have been better. However, days have been much worse, and could be. Cases in point: one of our beloved church members died this weekend at the age of 50 of a sudden heart attack. Another had a leg amputated and is still sick in the hospital. Another friend has a child not much older than my oldest who has been diagnosed with three types of leukemia, and his survival odds are limited. It was not that long ago that my own grandmother lay dying in a hospital, while my newborn son struggled in the NICU to take a single breath on his own. Somehow, I don't feel like I have the right to complain. By the standards set above, I had a pretty fabulous day, I think. Perspective. It's all in one's perspective. Don't forget that however bad your day is, someone else's is likely worse. Keep that in mind the next time your dog pukes, or your water gets cut off, or you get cut off in traffic. Some friends of mine in the MIS world were discussing home computing issues this past week, and one that we all encountered was how best to access old emails from previous accounts. The traditional thing is to archive old email within the confines of a desktop client, whether that is Outlook, Express, Eudora, or something else. Several years ago, on April Fool's Day if I recall correctly, Google changed all of that by introducing GMail. GMail gave the user gigabytes of storage, and coupled that with their well-developed search feature. At the time, GMail was web only, and had no real facility for interfacing with the desktop. Since then, Google has given the end user both POP3 and more recently an IMAP implementation (albeit somewhat quirky). Of course, many users have stuck with their old ISP email, which ties them to a single provider unless they archive it. Once archived, email is often handled within the email client, which is most likely a proprietary format. So the discussion topic that evolved from all of this was - how can the end user move old email from PSTs, Eudora archives, etc. into GMail? Gmail already has the feature of importing existing POP3 mail from active accounts, but we're talking about archive files here. Lots of tools exist to accomplish just such a thing, but require a new app to be installed (which is platform dependent, naturally), or require translation of the archive file into another format. But the solution we liked best was simply to use the tools we already have. If you combine your existing email client, its archive files, and a separate mapping to GMail as IMAP, the process is pretty straightforward. Open up the archive file. Copy the emails that you want to move to GMail. Paste into the appropriate folder in GMail. Sounds easy enough, and I wonder why I never gave this much thought in the past. Now, I have an archive of about 6 GB of mail dating back to 2004, all searchable, all labeled, and all accessible from any browser on any major operating system, not to mention the space freed up on the network. My only hope is that Google keeps expanding the size of their mailboxes. Otherwise, I will have to create alternate usernames for storage. UPDATE: Someone asked me about offline access. In this case, I would either use GeeMail, an Adobe AIR client that runs on Linux, Mac and Windows, or enable Google Gears for offline Gmail access. It has been... oh, about ten months since I last posted to my blog. This after being a prolific poster for most of the last seven years. I have to say that a lot of what I opined about was political in nature, as the lion's share of blogs seem to be. But standing on the political fence and yelling, and being yelled at, is so arduous these days. Society has become so polarized due to politics. There's a lot of what masks as debate, but it really is nothing more than oneupsmanship, name calling, and epithet hurling. It's like reading Crossfire, or the McLaughlin Group. So, I stopped. Cold turkey. The opinions stayed, but not the constant attention to the news cycle. Issues matter. Politicians and their antics, I can do without them. And the Kossacks and the Freepers... it just doesn't appeal to me. Anyway, I'm considering coming back to blogging, just not predominantly about politics. It doesn't do me any good to vent, really. There is no catharsis, no purge of the soul. So, in the coming weeks, I think I'm going to start hitting the little keyboard, talking about tech, and other stuff. And maybe someday soon, this blog will grow up, and move onto something else. In the meantime, go look around the web, find something that interests you, and talk about it. And if it starts to feel like work, stop doing it, and move onto something else. Blogging should be fun, not a task. Braves' broadcaster Skip Caray has died. I read the news about his passing on the AJC website this morning and was struck by memories of my childhood, listening to the Braves. I became a Braves' fan in the 70s, when players like Phil Niekro and Dale Murphy dominated the Atlanta headlines. The south thirsted for a professional team back then for which to cheer. Most of my friends adopted the Big Red Machine, but I long preferred the Braves' broadcasts. I will always remember listening to Pete Van Wieren, Ernie Johnson and Skip Caray calling the games. Lots of folks I knew didn't much like Skip's broadcasts, but I will long remember his dry wit, especially his call-in show where he often struggled to find patience with his callers. Known for his struggles with alcohol, I always found the line amusing when he commented "the bases are loaded, and I wish I was too." When he and Van Wieren were no longer the Braves' national broadcasters a few years ago, I was a bit sad. Today, I'm a bit sadder, as another part of my childhood, the voice of Skip Caray, is silent. This time last year, I was sitting in a hospital with my wife, who had just given birth to our third boy, Dylan. Readers of this blog will remember the journey we took from sheer excitement, to fear and anxiety to amazing relief over the course of several days. Dylan went from birth, to struggling for breath, to sedation in a NICU 120 miles away, to his final healthy journey back home. My wife has eloquently written today about those uncertain days. The memories of those days are somewhat clouded for me, not just because of Dylan, but because my grandmother succumbed to illness the very next week. My memories of August 2007 are both joyous and sad. But today, as we prepare to go visit our respective families, as I watch my baby boy play on the hearth with his See-N-Say, as he pulls himself up and smiles, I am thankful beyond expression for this child, and how special he is to his mother and me. Happy First Birthday, little Dylan. Daddy loves you. It's been a busy day here at home, so I'm just now catching the Fox News Sunday tribute to Tony Snow. It continues to amaze me how much love and respect there is for Snow by people from both sides of the ideological divide. Good and evil almost never express themselves as harshly and clearly as they did Tuesday morning. People we don't know slaughtered people we do, and they did it with contemptuous glee. Yet, even as clouds of dust and smoke rose from the rubble, even as family members tortured by hope and doubt took to the streets with pictures and pleas; even as mobs celebrated in Gaza, Cairo and Bagdad something shook itself to slow life. That something was a sense of ourselves. Kindness flourished amid the flames. A couple carried a disabled man down 68 flights of stairs. A priest crouched to give last rites as a mighty tower collapsed and the hand of God closed about him. A man and woman, their hope gone, held each other and leaped. A solitary candle, a flag, a tear. These are the tokens of our renewal. The United States had a spirit even before it had a name -- one of faith and freedom; of ambition tempered by public piety. We once were a nation of neighbors and friends. We are again today. We once were a nation of hardship-tested dreamers. We are again today. We once were a nation under God. We are again today. Our enemies attacked one nation. They will encounter another for they underestimated us. Today, in our grief and rage; our determination and hope, we have summoned what is best and noblest in us; the kinship that awes our enemies and friends alike. We are again -- Americans. Snow had trouble keeping his composure that day, and I have long admired his words. They were profound then, and they remain so today. This morning as I was preparing myself and the boys for church, my wife came out of the office and whispered to me that Tony Snow had died. I recalled that he had a speaking engagement of some sort weeks ago and had to cancel. I recall thinking at that time that Snow's time was probably short, especially knowing about his bout with colon cancer. Like most observers, I've had hours to absorb the showering of affection and the displays of grief from pundits, journalists, and the like. I watched a bit of Fox this morning, and have read countless eulogies online. I thought I would reflect on Tony Snow by remembering the things as a viewer of news and political punditry that stood out about him. I remember my first exposure to him when he guest hosted for Rush Limbaugh. I remember his unique voice, and how he brought a much more personal touch to the E.I.B. microphone than Rush ever did, or could. I fondly remember his years of hosting Fox News Sunday in its infancy. With all due respect to Chris Wallace, he doesn't hold a candle to Tony Snow. I remember his sparring with Helen Thomas and David Gregory in the White House press room. I also remember his infectious optimism from his interviews with the same David Gregory and with David Letterman last year. But the one thing I will always remember most was his closing of Fox News Sunday on the air a short time after the 9/11 attacks. I don't remember much about what he said, but I remember how difficult it was for him to conclude his remarks. He was tearful, sincere, and he reflected the thoughts of all of us in America during that time. His attitude about life, his love for wife and children, and his moral fortitude are something we should all aspire to have. If I speak as if I knew Tony Snow, which I obviously didn't, it is because he conveyed that sense of connection when he was on the radio, writing, being a press secretary, or just sitting down for an interview. This is the Tony Snow I will remember, as will millions of Americans who knew him from afar. And today, the world has lost another great and upstanding man. It seems as if they are all falling by the wayside these days. I'll try to catch the Fox News Sunday tribute tomorrow, and then I will go about my business, hopefully with a little more sense of mortality, and a little more love for those around me. My wife, ever the photographer, has put together a fantastic montage of our boys, set to music. I'm not even sure of the song, except that it's "Beautiful Boy", and I really like watching this video. I also thought I would give Flash video hosting a try on my own server to see how it works out. Watch and enjoy. The Wall Street Journal asks "Where Would You Spend $600?" I thought I would answer that question on my own blog. For the typical middle-class family, finances have become much more strained lately. Fuel is high. Food is high. Debt is mounting. My own family received $2100 (family of 5, less than $150k in AGI). We first gave 20% to our church, as we have embarked on a sanctuary remodeling and roofing project. Then I allocated $400 for clothing for the wife and boys. Assuming you don't buy Hilfiger and A&F, $400 actually goes a long way these days for clothing. Then I paid down one of our gas card accounts by about $500. I also bought new brakes for the van, and an engine diagnostic tool which I have needed for a while. And to help out the wife with cooking, I took the family to On the Border for dinner, and Johnny Carino's for lunch. The rest is sitting in savings, but is going to likely be used to spend on comsumer items. I've had my eye on a Boston Acoustics speaker system to replace the one that is built into our LCD TV. I'd like a tow hitch for our minivan, and a cargo hauler for our upcoming trip to see our families. I've looked at some other things too, like a recliner, some bookshelves, an Adirondack swing, a new pot rack for my wife's kitchen, and maybe some new dress shoes. In other words, the stimulus fund has actually helped us accelerate purchases we were going to make anyway, and moderately helped with some debt, while also giving us a little bit of luxury. While the economics of throwing money to the masses is questionable, I am not going to complain about receiving part of my own tax money back for my personal use. I keep hearing how poor the economy is. I'm sure outside of my little box in Texas, things are troublesome. But here, that's just not the case. Despite the high cost of gas, the roads are just full of commuters, and shoppers. It took me 30 minutes to get from my office to the automobile service center on Friday. It felt like I was back in Connecticut on the Bulkley Bridge at 5 pm. The big box stores are always packed. Target, Best Buy, Kohls, etc. have an abundance of shoppers. If people are cutting back, they aren't cutting out retailers. As far as housing goes, I read about people losing house value and equity. Not here. Housing starts are still in full bloom. Our subdivision, a new addition to the area, is still seeing growth. Houses seem to sell after 30-60 days, which doesn't seem unreasonable to me. Personally, my property assessment went up 5% this year. So while America loses equity, Texas doesn't seem to be. Recent reports reveal that more Fortune 500 companies are now based in Texas than in any other state. Job growth in our state remains high while unemployment rates are still low in spite of negative national trends in this recessionary environment. Texas added more than 213,000 new jobs last year, and job growth has exceeded one million over the past four years. Maybe all of this is indicative of just how bad things are in the rest of the country. Or maybe it shows how productive the economy can be when companies can locate in a low-tax area, where residents can live without a punitive state income tax, and where the cost of living is generally low. Maybe if other states got out their own Petri dishes, and experimented with ways to promote growth in their own backyards, they would see similar results. Just maybe. I would be remiss if I didn't wish all of the mothers out there, including mine, and my wife, and my mother in law, and my grandmother in law (whew) a happy Mothers' Day. So... Happy Mothers' Day to you all! I haven't been blogging much lately, since, well... there are far more prolific bloggers than I, plus I haven't had a lot to say, plus we have a huge SAP implementation going on, plus... well, blame Websense, who has the audacity to ban all things "Blogspot" because they have been designated "Social Networking Sites". Whatever. Yet, today, I feel more compelled to find a way to blog, so I'm going back to using my Treo (which I did many times in the past, but it's not as convenient as using a fancy laptop). Why today? Today is May 9th. For me, that is a meaningful date. On this day in 1925, my dear grandmother was born. She was 45 years young when I was born, and I always talked to her whether by phone or in person on her birthday. Generally, I asked her if she felt a year older (she did), if she liked her gifts (she did), and what she was going to do the rest of the day (sit and relax, most likely). Birthdays in my family are meaningful days. Being an only child, that meant a windfall for me. But as I got older, I simply enjoyed sharing other people's birthday's with them, especially Granny's. The gifts aren't important. I seldom remember what I got for her, or my Mom, or even my kids or wife. It's the time spent together. The conversation. The love between family members, in this case, between grandmother and grandson. This birthday is different, of course. Granny died in the summer of last year. Not a day passes that I don't see something that reminds me of her, especially my youngest child, Dylan, whom she never met, but for whom she endured quite a lot of pain in her last days, just so she could know that he was going to recover from his own medical issues. For me, he will be forever linked to her. So today, when I get home, I will look at a few pictures, hug my kids and my beautiful wife, but especially when I embrace my littlest one, I will think of Granny, shed a tear, smile a smile, and long for the day that we all can see her again. Happy birthday, Granny. We miss you. Need ASP.NET, VB, VB.NET, or Access development? Proudly blogging on a Treo 650 using Vagablog 1.9.